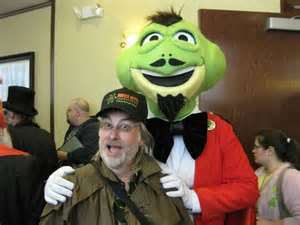 It was the evening of Saturday March 27th, 2010, the peak of the 2010 Horrorhound Convention in Indianapolis, when I first met “Uncle Lar.” My friend and I had just eaten dinner at a terrible nearby Mexican restaurant (which has since been condemned) with our heads swimming in a pool of Margaritas. While stumbling into the Marriott, I bumped into a man wearing a Colonial hat and holding a handful of DVD’s. Needless to say, the DVD’s loosened from his grip and became a scattered mess on the pavement below. I immediately apologized and helped him gather them back up before noticing familiar names on the discs such as The Bone Jangler, Jebediah Buzzard, and Monster Madhouse. “Oh, I see you’re a fan of horror hosts!” I said. It would was a gross understatement. The 2010 March Horrorhound was one of the first major gatherings of horror hosts, in this instance to pay homage to their dark matriarch, Maila Nurmi’s Vampira. This was four months before David Albaugh and I started this site and our friendship was relatively new. My job was to gather as much horror hosted shows and information as possible and share them with him. “Bumping” into Uncle Lar was truly The Law of Attraction at work and I’d soon be given a wealth of understanding. I discovered that he’d been a fan of hosts for years and worked hard to share Public Access shows across the country. Often at his own expense, he’d burn copies of the various hosted shows and then spread them out to other hosts so they could be shared with their own audiences, thereby helping everyone receive optimum exposure. So Illinois’ The Bone Jangler could be enjoyed in California courtesy of Remo D and vice versa. What was in it for him? Nothing but the pleasure of “spreading the horror host love” as he’d once told me while also being able to watch and enjoy the different shows himself. After Horrorhound ended, we stayed in touch and both David and I had several conversations with him. We learned all about the HHU (Horror Host Underground), were given opportunities to see the various personalities out there, and even spoke of comic books; another mutual interest. Though we’d kept in touch, the last time we’d spoke was this previous fall. I was in the process of moving as my life was in upheaval and we opened up to each other about many things. I discovered that Uncle Lar, despite his humble life, was someone who accepted people for who they are, regardless of the choices and circumstances they’ve created in their lives. This is a lesson that I have only begun to learn these past few weeks. One lesson we can all learn from him is that life is truly short and friendships, no matter how close, should never be taken for granted. Everyone has something to teach us and it is up to us to listen and internalize the message. Uncle Lar knew that the secret of happiness was to accept people for who they are and not what we want them to be. He loved all the horror hosts and it was the work that they did that gave him joy in a life that was often challenging. He didn’t discriminate, and was able to enjoy them all while working to share that joy with others. For those of us who had the privilege to know him, I know I am not alone in saying he will truly be missed. ← 40 YEARS OF COUNT GORE DE VOL!